Get your promotional tote bags ordered today for wider brand exposure! 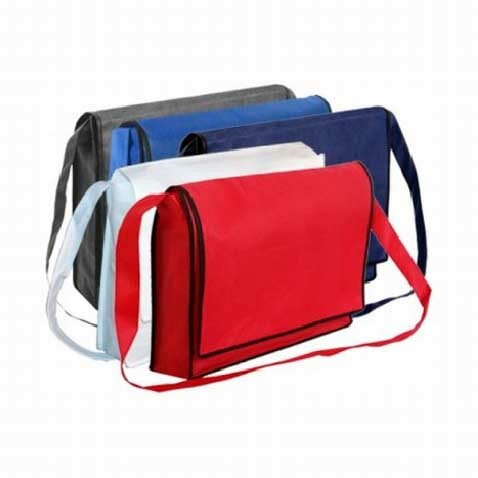 The perfect size for carrying around textbooks, trade show and expo items or any number of other practical uses, these non-woven tote bags will be carried around, constantly displaying your logo. On campus, to the gym or swimming pool, to bring lunch to work; whenever someone walks out of the house with one of your promotional tote bags for whatever reason, your brand will be on display. 80gsm non-woven polypropylene. Black bound seams. Shoulder strap. Double Layer Flap Over. Decoration option: Screen print (nylon bags excluded), Heat transfer. SKU:B03. Category: Non Woven Tote Bags.